→ GPL-"Hey, anyone need a racer?" 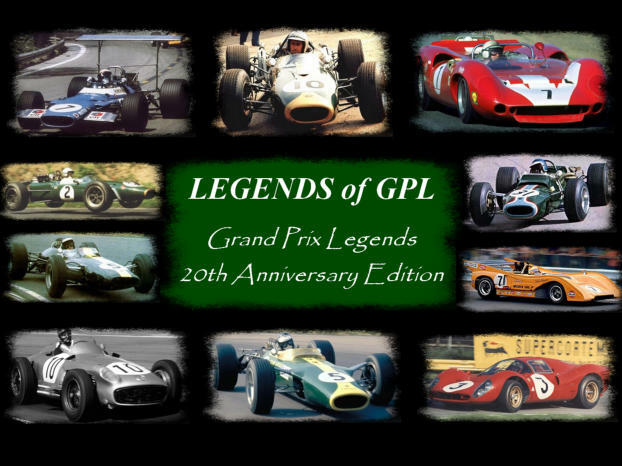 Grand Prix Legends is getting TWENTY! - Race duration max. 30 min. – HANDICAP: The winner of the 2nd race = last position on the grid in third race and so on. If a drivers skips a race, he has to start behind the winner of the last race, means behind the set drivers. - All drivers will start in the same car of the "LEGENDS of GPL" mod! That means for example for the 1965 F1 Mod race we will all start in the Lotus 33/Coventry Climax. The race sequence depends on the release date of the mod. -> Create a new player (e.g. Firstname_LastnameLoG). Then install the LoG mod. or you adjust the default setups that come with the LoG mod to your liking. The iGOR >7 car slots bug is fixed now! A ) For the 1967 F1 Mod race we will use the 1967 Lotus 49/Ford Cosworth instead of the 1967 Brabham, as the 1967 Brabham gives CTDs! B ) The iGOR version that is hosted on a server atm does not support more than 7 slots of cars (GPL originally only had 7 cars), so you can only join on iGOR with cars of any GPL mod that use the slot 1-7. If you want to join a server with a car that uses a slot higher than 7 you can only join on the server directly via IP in multiplayer of GPL and not via iGOR. That means for these LoG cars you can not join via iGOR, but directly via IP multiplayer. To do so go to GEM+, choose your LoG mod player, the track and the car and start GPL. In GPL you have to enter the GPLRACER server IP in the Multiplayer menu. The IP will be given in iGOR chatroom #GPLRACER before the race. Edited by Stefan Roess, Nov 04 2018 - 05:06 PM. Edited by Stefan Roess, Oct 29 2018 - 07:34 AM. FWIW, the server IP is in the details window of the selected race in iGOR. Edited by Stefan Roess, Nov 03 2018 - 05:45 AM. This replay file does not contain practice data. If you want to race with us tonight on day 2 of the event just come to iGOR chatroom #GPLRACER about 5-10 minutes before the 1st race (20:00 CET). Even so you haven`t raced on day 1 you can join us. You can also race for just one race. Great job organizing and hosting this race series Stefan. I wasn't aware that you were doing it all in one weekend which is a unique idea. Hope all the racers are enjoying the mod. Hope all the racers are enjoying the mod. Sorry for my wrong track link for the Riverside 66 race and the confusion and delay it has caused. Results are wrong. GPL replay save bug. Bastian finished behind Uli, if I remember correctly. And Bastain`s fastest lap is wrong. Edited by Stefan Roess, Nov 05 2018 - 03:25 AM. In hindsight I think it would have been better to install the track later and do the Riverside 66 race at last race of the evening. This was pretty annoying as Uli and me spent two evenings testing all mod cars on all tracks and have found LoG mod bugs and also the iGOR server settings problems with cars using a slot higher than 7. Many of those findings got solved before with the help of Lee Bowden and Lou Magyra. Thx guys for the quick fix! So, actually, we had prepared the event pretty well. But we are just humans. According to the posts you had fun and liked it. Maybe we will repeat it in some way again. Maybe as a single event or maybe as a cup event with 9 races the whole year? The best race I had was the 1st race with the 65 Lotus 33 at Monza. Amazing tight slipstream races with up to 7 cars for almost the whole race. I was expecting a mass crash every moment. This was one of the best races I ever had with very skilled drivers. This replay is a keeper. Maybe we should do a such a spec race for the GPLRACER 65 mod cup next year? Thank you all for joining us and Uli for the idea for the event, the reversed grid and points calculations and the time you invested to make it happen. And also to Paul for some support in iGOR. Edited by Stefan Roess, Nov 05 2018 - 03:56 AM. Just a thought for future races. Perhaps allow the players to choose their car for each race, but not use the same car twice. That way you'd get a mix of cars at each race. Thank you so much for this event! Thanks Uli, Stefan and all involved, what a joy! and capable of following the very fast drivers ............. what a dream. and that bothered me alot while racing (and do br= Also sorry for missing Spa67 with the Lotus because of bedtime. But overall I liked it alot. Cup-racing 2019 I am in favor!! Big thanks for racing and making history guys. Edited by Pedro, Nov 05 2018 - 01:25 PM. Big thank you to the organisers and all who took part. It was a great challenge and experience. And my legs are still sore! Mark, congratulations for winning the event! Thank you for joining us, especially from a totaly different time zone! I hope to race with you again. Edited by Stefan Roess, Nov 06 2018 - 04:50 AM. Edited by GrandPrixYannick , Nov 06 2018 - 09:48 AM. Back to GPL-"Hey, anyone need a racer?"